Stephensons Trials at Workington 16th September 2017. 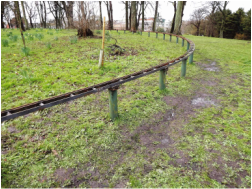 We have a raised model railway track (3.5 & 5" gauge) at Workington's Curwen Hall Park (adjacent to the start of the A66) and run locomotives on most Sundays between 2pm and 4pm (weather permitting). are held at Curwen Park Clubhouse Workington Cumbria on the 2nd Wednesday in each calendar month from 7.30pm.